When US mum Lynn Heinrich got a little bit pranky with her Elf on the Shelf gag, her little boy Miles returned serve in a terrifyingly ingenious, innocently insulting and messily strategic way! It all began when Lynn thought she’d get a little bit creative with her Elf on the Shelf move. Lynn figured she’d poke some ‘gentle’ fun at the whole thing, hatching a naughty deed and pinning the mischief on her son Miles. “Ha-ha-ha-ha,” Lynn may have chortled to herself as she drifted off to sleep that night. It seems the sleep was the SLUMBER OF FOOLS. 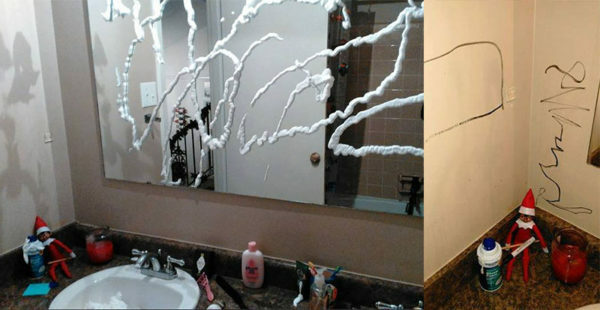 Miles – a true Elf on the Shelf believer – completely freaked out when he saw the mischief-slash-shaving-cream prank. Miles’ sought to avoid making the naughty list this late in the game. This is where things got decidedly freaky. Lynn was part-terrified, as she recounted Miles’ modus operandi, and part-inspired. Good point Lynn. Good point. We probably would have yelled, but a spicy Facebook vent is a viable alternative. Lynn was pretty keen to let the Elf on the Shelf folk now that she – along with countless other parents – has had it up to HERE with their Christmas shenanigans. Homicidal crimes seem to be Lynn’s theme. Happily, a less incensed Lynn updated her post later, to say that thanks to the high-gloss paint and oil-based marker the elf Miles used, the “squiggly lines” disappeared as quickly as her morning-after enthusiasm about the shaving-cream gag. Meanwhile, thousands of Elf-on-the-Shelf-weary parents from across the globe have liked and shared Lynn’s status, a small act of resistance during a taxing festive season. May you avoid elf murders and be completely non-ugly!